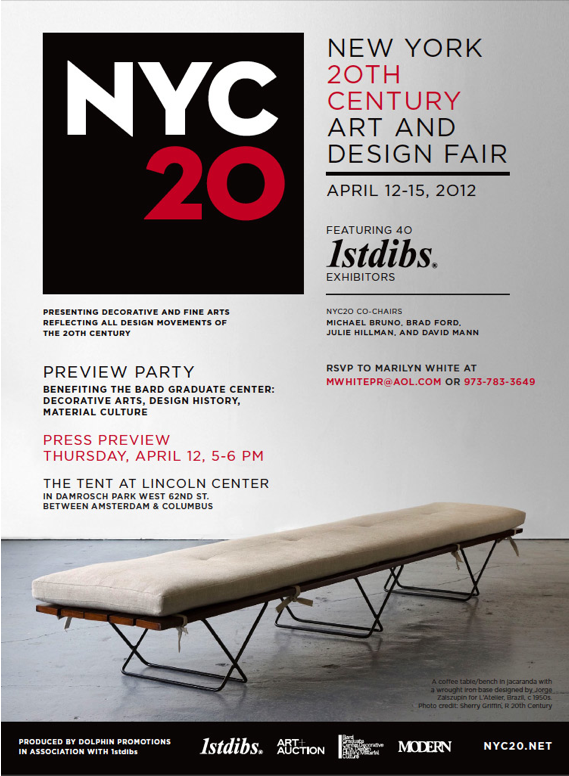 New to the NYC show circuit, NYC20 will feature 36 1stdibs dealers from across the US and Europe. Who is the brains behind this showcase of 20th century furniture, lighting, sculpture, paintings, jewelry, silver, glass, ceramics, photography, textiles, prints, and vintage clothing and accessories? The talented Michael Bruno and his fantastic co-chairs Brad Ford, Julie Hillman and David Mann. Held from Friday, April 13 – Sunday, April 15, the fair will take place in the gorgeous Tent at Lincoln Center. An early buying preview party, benefitting the Bard Graduate Center: Decorative Arts, Design History, Material Culture, will be held on Thursday, April 12. Connoisseurs, Enthusiasts and Collectors, click here to purchase tickets. Weekend admission is $20 and includes show catalog with return entry. Tickets may be purchased at the show entrance.